Martin Samuelsen celebrates his goal against Preston with Erhun Oztumer. Photo: Joe Dent/theposh.com. On-loan Peterborough United star Martin Samuelsen insists the fourth round draw of the FA Cup holds no terrors for him or his team-mates. The 18 year-old West Ham midfielder won the sponsors’ man-of-the-match award after scoring the opening goal in a 2-0 third round win over Championship side Preston at the ABAX Stadium yesterday (January 9). Posh star Martin Samuelsen glides past Preston defender Marnick Vermijl. Photo: Joe Dent/theposh.com. It was a second goal in two games for a player who has extended his stay at Posh until the end of the season. Samuelsen insists that was an easy decision to make and he can’t wait to play in many more big matches before the end of the season. “I’m glad I decided to stay now!” Samuelsen stated after the game. “I enjoyed the intensity of my first FA Cup match. I love playing in big games and I hope there will be many more to come before the end of this season. “It was a very good win for us and we are now all excited about the draw. We’ll take anyone in the next round. We feel we can beat anyone. “It was good for me to score again. I have come to here to create goals and score goals, but I have to thank my team-mates and the manager for my opportunity. It’s important that I keep my form going. “From the first second I arrived at the club everyone has made me feel very welcome. The manager is one of the best I have worked with. He is tactically very good and he is an excellent motivator. “He has given me the confidence to try and express myself and so have my team-mates. When you know everyone backs what you are trying to do it gives you the confidence to try things. “We have a lot of self-belief and a great team spirit. We deserved to beat Preston, but they also had chanaces to score. 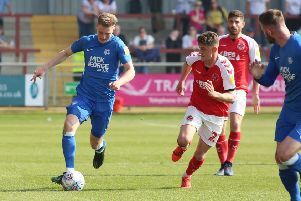 “Short-term I want to help Posh get promoted and long-term I would like to get into the West Ham first team and help them win trophies as well. There is no rush though. I want to prove myself at League One level first. The draw for the fourth round of the FA Cup takes place live on BBC Two tomorrow (from 7pm). Posh are in the fourth round for the first time since 2008.